This post is to introduce you to the kind of result I can achieve for you with a real-world example of a commission I did for a client some time back. "This is the kind of result I can achieve, with a real-world example I did….."
I’ve put the before and after images up below and I think the results speak for themselves. The image is one a client sent me on an Agfa slide film. 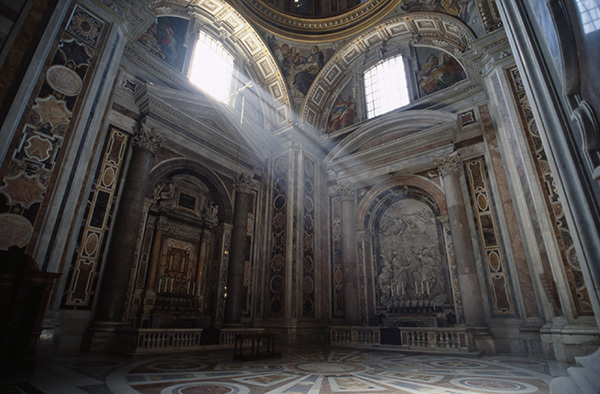 The before image, taken in St. Peter’s Basilica at the Vatican, is effectively straight from my professional-level Epson V700 scanner and has basic effects such as dust removal and basic optimisation for the slide film type. The after image shows my further optimisation in Photoshop, which includes custom adjustment of the RGB channels in the curves tool, amongst a number of others. Just click on the double arrow head over the image and move your mouse, or finger on any mobile device, left and right to see the results of my editing. I hope you like what I did with this image. If you did, and you have some old roll, transparency or slide films you’d like converted to digital and worked up, then do feel free to contact me. For scans that start at £2.50 per image, and £5.00 per corrected image, this represents excellent value for money. And, if you have a large number of images, slides or transparencies, I am happy to discuss bulk discounts for my work.